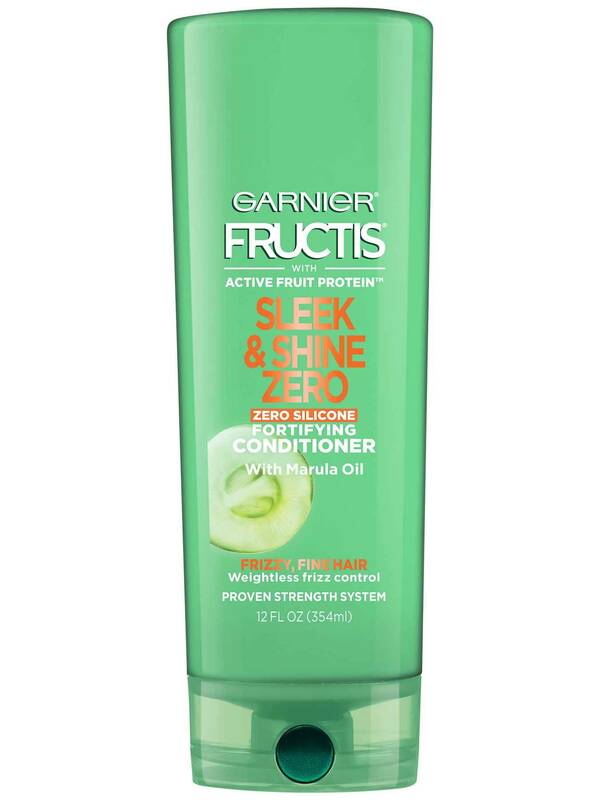 Lightweight, non-heavy Fructis Sleek & Shine Zero Conditioner with zero silicone and with fairly & sustainably sourced Marula Oil, helps discipline frizzy, fine hair for weightlessly long-lasting smooth hair with natural movement. No weigh down. No greasy feel. 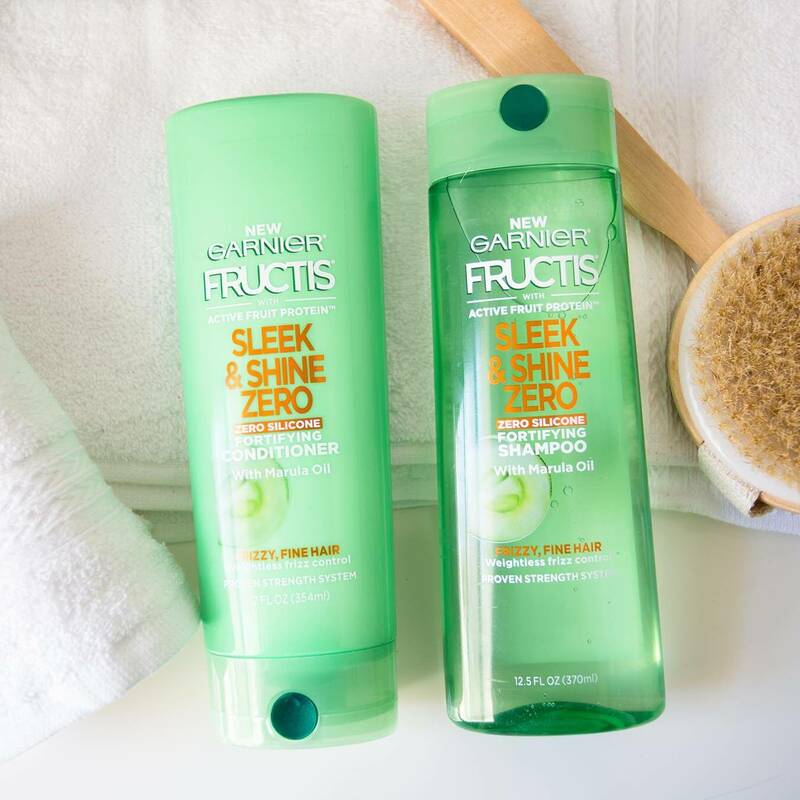 After using Sleek & Shine Zero shampoo, apply conditioner to hair from root to tip. Rinse. Follow with Sleek & Shine Zero leave-in spray. Rated 5 out of 5 by CH2018 from Love it! I have sensitive skin and fine wavy hair. Love this product! Dandruff issues gone and No build up! Rated 5 out of 5 by Michele D from Great hair care product!! 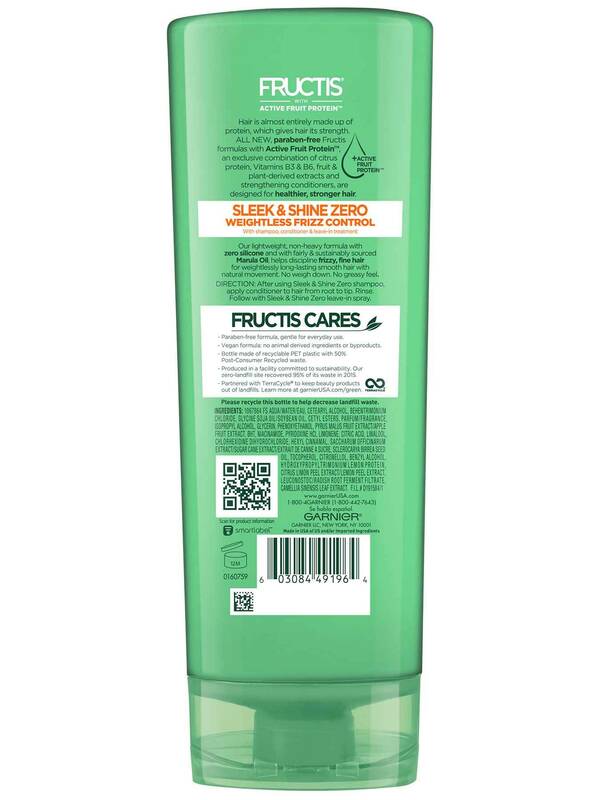 I purchased Sleek & Shine Zero conditioner and I loved it!! I used it after I used the shampoo and the way it softened and conditioned my hair was amazing!! My hair looks and feels the best it ever has in my life!! Rated 5 out of 5 by Ren37 from Excellent Conditioner It help to keep the my fizzy hair down and it helps my dry hair. It makes my hair managable. Rated 5 out of 5 by Kmb1972 from Best Conditioner Ever! Ive been using this for a while now and it is the best conditioner ive ever used. My hair usually gets greasy at the end of the day, even if i washed it that morning. With this shampoo and conditioner, i no longer have to worry about that. Plus it smells great! Rated 5 out of 5 by mermaidgirl from Lightweight Moisture and Frizz Control This is my very favorite conditioner-I've tried all sorts of brands and price points, and this conditioner does exactly what my hair needs! I have dry, yet fine, frizzy hair that is easily weighed down, and thankfully with this shampoo and conditioner, I can have healthy, moisturized, shiny, and frizz-free hair without any buildup or added weight! This also gets tangles out beautifully, which is necessary for me! Thank you so much for making this product and please, please, please never discontinue it!! Rated 5 out of 5 by caracas from Excellent This conditioner smells amazing! I liked the lather and the way my hair felt after rinsing.